Spanning a significant period in the careers of both writers (for her, the beginning, and for him, its maturity), these previously unknown letters from H.P. Lovecraft to Zealia Bishop provide a fascinating window on the process of artistic creation, the literary scene of the 1920s, the way Lovecraft made his living, and the private lives of two very different individuals. Starting out as a formal business correspondence between a professional “revisionist” and his client, the letters grow in revealing personal detail over the years. Lovecraft condoles [sic] Bishop on the death and illness of loved ones, shows his concern for friends who struggle with poverty during the Great Depression, and gives amusing insight into his partnership with Frank Belknap Long, one of his “adopted grandchildren” who becomes his collaborator in the revision business. We get detailed descriptions of Lovecraft’s personal library, his walks through his hometown of Providence, and even a lovely description of New York City, a town about which he had very mixed feelings. We get highly specific advice to an aspiring writer, right down to detailed lists of reference books, and a glimpse of some of Lovecraft’s competition in the field of freelance literary revision. Among many other things, Lovecraft reveals his very surprising attitude on book collecting, his love of bicycle riding, and mentions many of his own most famous creations, including the origins of Abdul Al Hazred, night-gaunts, and some of his greatest stories. There are also a number of fascinating—and funny—instances of him giving advice that he himself does not follow in his own literary work. The collection is a great view of his whole personality and touches on many of the iconic elements in his life and work. Lovecraft often included postcard views, helpful booklets, newspaper and magazine clippings, and other items with his letters. The HPLHS has endeavored to provide as many of these extras in this collection as possible, so you can see what it would be like to get a letter from H.P. Lovecraft. 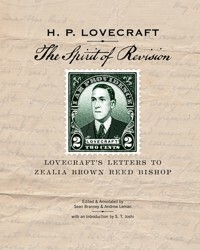 The Spirit of Revision: Lovecraft’s Letters to Zealia Brown Reed Bishop.. By H.P. Lovecraft, Edited & Annotated by Sean Branney & Andrew Leman, with an Introduction by S.T. Joshi. Glendale, CA: The H.P. Lovecraft Historical Society; 2015; ISBN 978-0-692-49524-7; paperback, 190 pages. This book may be purchased in paperback from Amazon.com or Barnes & Noble or directly from the publisher, The H. P. Lovecraft Historical Society.